1947 was a banner year for Christmas Movies. It was a significant time for several reasons. The country was enjoying a phenomenal economic recovery after the austerity of WWII, and the beginnings of the post-war baby boom meant there were many new stockings for Santa to fill. 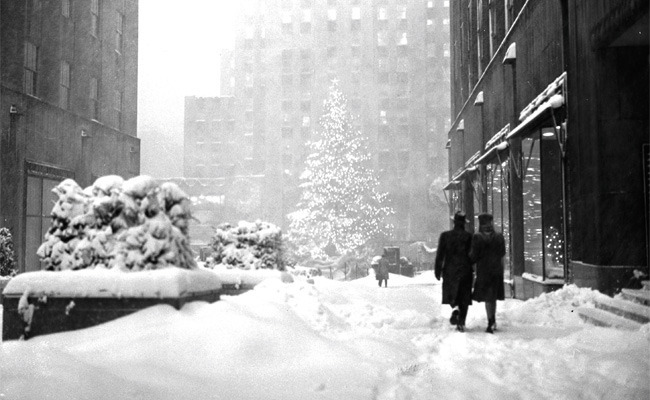 1947 may have been the ultimate White Christmas; the Great Blizzard of 1947 blanketed the Northeast, dropping 26.4 inches of snow in Manhattan’s Central Park on Christmas Day and the day after. It was also the year when the first Hollywood Blacklist was created, one of the opening acts of America’s Cold War. Three of the greatest Christmas movies of all time are 1947 films; It’s A Wonderful Life, Miracle on 34th Street, and The Bishop’s Wife. The factors that came together to put Hollywood into such a Christmas spirit are open to debate. No one really knows if it was the Post War optimism, or simply a happy coincidence of studio scheduling. What is known is that although all three are 1947 films, their genesis began months, even years before their release. Frank Capra‘s It’s A Wonderful Life was originally scheduled for release in January 1947, but the premier was moved forward to qualify the film for the 1946 Academy Awards (not an auspicious move for the film, future critics point out that there would have been less Oscar competition in ’47). 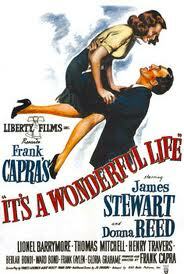 the film was inspired by a 1939 short story, The Greatest Gift, which author Phillip Van Doren Stern had used as a Christmas Card. Cary Grant‘s agent had seen the story, and felt it would have been a marvelous vehicle for his star. The agent convinced RKO to buy the rights to the story, but the studio’s writers were unable to make anything of it. 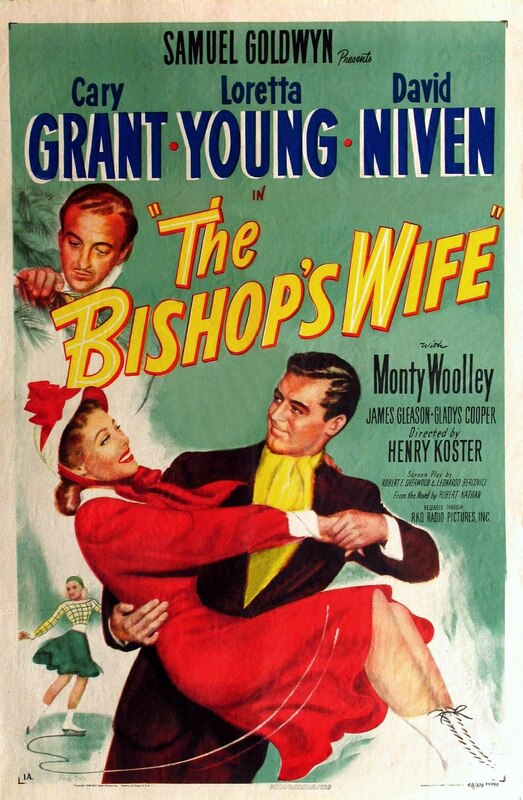 Grant went on to star in The Bishop’s Wife, and RKO was very happy to unload The Greatest Gift when Capra became interested. The film opened to mixed, but generally favorable reviews although Capra felt the film was largely dismissed. The film was unsuccessful at the box office, but because of confusion concerning the copyright status (due to a clerical error, the copyright was allowed to lapse) the picture became a Holiday staple on Television during the 70s and 80s. This also gave critics a chance to reacquaint themselves with the film, which raised it to the classic status it holds today. is a film that should not have done as well as it did. 20th Century Fox considered the project a B film, although they gave the project Maureen O’Hara as a star. Everyone involved in the film consider it to be one of their most enjoyable experiences in movie making (6 year old child actress Natalie Wood was convinced that Edmund Gwenn was indeed Santa Claus, and was notably shocked when he appeared at the Wrap Party without his beard). Scheduling was tight for Miracle. The director was insistent that actual footage of the Macy’s Thanksgiving Parade be used, so the production moved to New York to capture those images with the Stars, as well as crowd scenes of actual Macy’s Christmas shopping. Many interior scenes were shot in the store after hours. 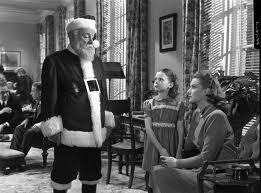 The film was complete by spring of 1947, and studio head Darryl F. Zanuck decided to release the Christmas film in May. Although Zanuck felt that more people go to the movies in the summer, there remained the problem of promoting a Christmas movie in springtime. The answer was the radical step of using a trailer that did not show any scenes from the movie. At a time when most films had an expected two or three week run in theaters, Miracle continued showing until after the Holiday Season. The simple and appealing story has been remade several times, as well as being colorized, but each new version serves to only deepen the public’s affection for the original black and white version. In The Bishop’s Wife, Samuel Goldwyn brings a powerhouse cast together in search of movie magic. Archie Leach used Vaudeville as an escape from a troubled childhood. About the time his friend Fred Allen was going into radio, Leach moved to Hollywood and changed his name to Cary Grant and became a movie legend. David Niven was an actual “officer and a gentleman” and eventually the inspiration for the James Bond character. Beautiful Loretta Young was brought in nearly at the last minute to play the title role. Casting for the film went through a few revisions before the magic combination was set. Dana Andrews was to set to play the Bishop, with Teresa Wright his wife and Niven as Dudley the Angel. Wright was forced to bow out due to pregnancy. Goldwyn was forced to lend Andrews to RKO in order to borrow Loretta Young. Grant was one of the first major stars to work outside the Star System (he did not renew his Studio Contract, which allowed him to choose his projects), and had been interested in an early version of It’s A Wonderful Life, but The Bishop’s Wife was to become his Christmas role. When filming began, Goldwyn was dissatisfied with both the script and director William A. Seiter. After rewrites and putting putting Harry Koster in the director’s chair, a further decision was reached to swap Grant and Niven in the Bishop and Angel roles. Lux Radio Theater, The Screen Guild Theater, and more adapted It’s A Wonderful Life, Miracle on 34th Street, and The Bishop’s Wife and other great Christmas Movies on the radio often using the original cast. This entry was posted in Christmas, Lux Radio Theater, Old Time Radio and tagged Bishops Wife, Cary Grant, David Nivens, Harry Koster, Its a Wonderful Life, Miracle on 34th Street. Bookmark the permalink. I’m looking for a recording of a radio show that my local station used to play every year in the wee hours Christmas morning. I believe it must have been a pre-recorded program that was sold to radio stations. It was too grand a production to have been made locally. Problem is, I don’t know how to describe it in a way that is specific enough to Google. It was program of music, and short spoken statements like, “To children, Christmas is about toys…” Which lead into the song “Toyland” Also, there was the repeated transition between songs that went, “Merry, merry Christmas” sung in a haunting, drawn out melody. I know that’s not much to go on. I think that only a person who’s actually heard it would know what I’m talking about, but I’d love to be able to hear that program again.